Sometimes nature plays strange games. It brings close, two people who are different from the outside, rather opposites but very similar from within. Like, in terms of thoughts, general views on life, likes dislikes and so on. The image above depicts the same situation. 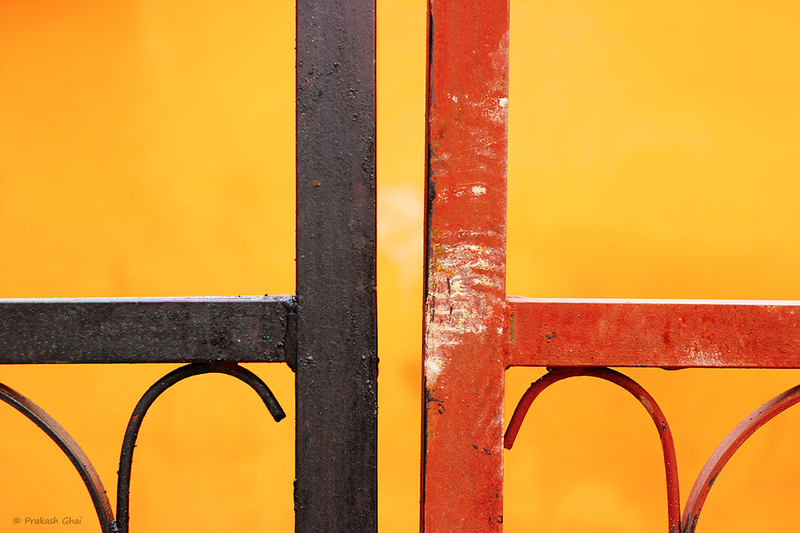 These two house gates belongs to different houses but since they were both open at the same time, they ended up being in close company of each other. Their colors do not match, they are different. But if you notice their designs, they are identical. By identical design is what I mean same from within. I generally do not center split my photos, as they don't look appealing to eyes but here, since the center expands to both ends, it definitely generates some interest in the mind. In such photos you cant do much variation in terms of composition, the key to such photos is spotting the right subject. Stay observant, happy clicking. I was there at Diggi Palace to attend the Jaipur Literature Festival 2015 and while I was standing near the Google Tent listening to some internet discussions, I spotted the slanting rays of the sun falling on this beautiful green leaf illuminating it completely. I was very disappointed with my first few shots as behind the leaf there was a black backdrop. I thought I'd rather look for something else. Then to my right at about a height of 20 feet, I spotted a 1 feet broad area covered with blue cloth. 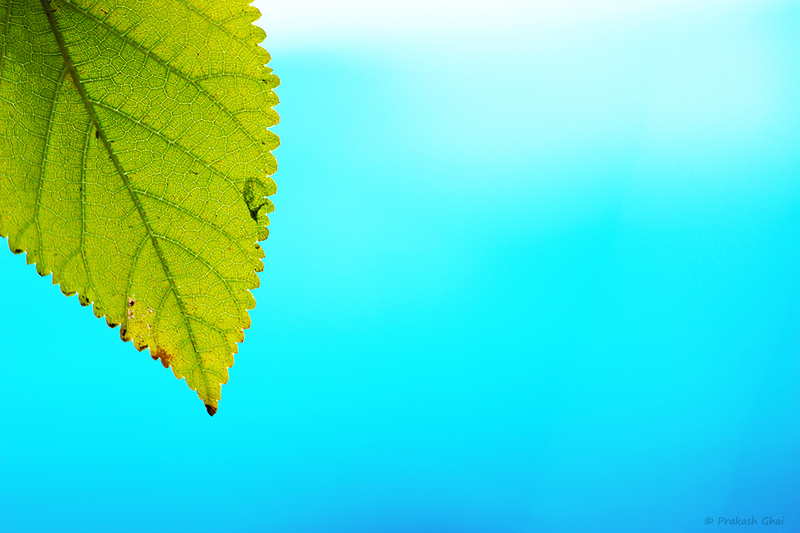 I thought why not have that sky high blue as a backdrop for this green leaf. The regular blue sky wasn't available as it was partly cloudy. So, I went down on my knees to my left behind the leaf and had my camera pointed at roughly 45 degrees towards that sky high blue area. I used a lower f-stop number to blur the background and took the shot. Of course my knees got dirty but when I reviewed the shot on my LCD screen I knew I had my Blue Lagoon Cocktail ready, garnished with some fresh mint leaves. Sometimes the blues or bad mood gets over extended, which is depicted by the long shadow. Note, that the shadow is straight here signifying our innate nature to hide and only show our good side to others. In my earlier photos I have used long diagonal shadows. 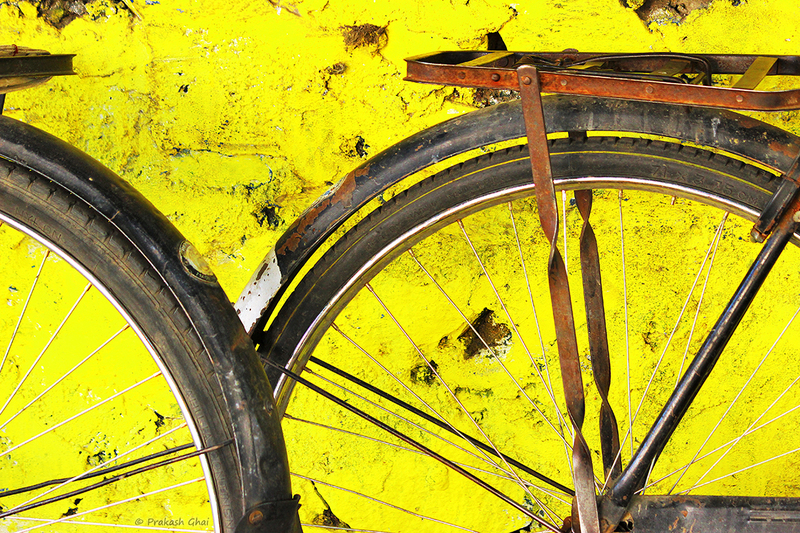 The Photo falls under the Minimalism as Less Elements category. To compose, I moved as close as possible to the subject and then further zoomed in using my 55-250mm lens. Editing was a challenge, as to display the same blue as what the eyes see, is very difficult in such photos. I had to increase the vibrancy, contrast, brightness and highlights. Editing single color photos looks very easy but it is much more difficult than editing the multicolored ones. The two small rectangles on the high-rise building's wall means that success is best shared with your better half. People tend to forget about their companion while they are busy toiling in their office, or when they have a big goal in their mind. They think once the money flows in everything will be alright. There will be love again. They forget that once the peak of their relationship dies, it is very difficult even to get it back to normal. Of course love, still remains but it loses its charm. Imagine you are watching the very famous movie "Titanic" and there is a 1 hour long interval/intermission in a 1.30 hour movie. 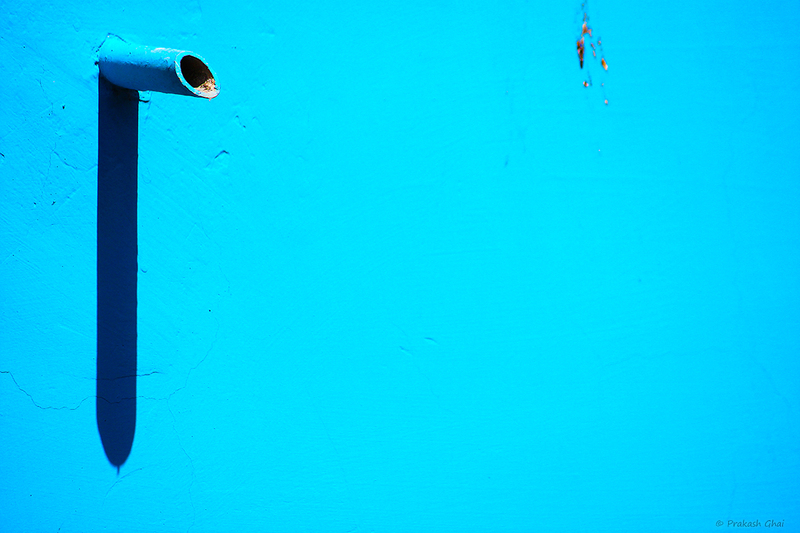 The photo falls under Minimalism as Simple Geometry category of Minimalism. To compose, I took the shot from a side angle with the camera a little tilted in my hand which helped me to create the diagonal line on top and to keep the sky minimal. The rectangles were then just allowed to fall in place. There used to be a time when people used to judge others based on their character, the values they had, their ethics, and the words they spoke. Post that came a period where the focus shifted from character to clothes. May the best dressed Man or Women get all the respect and attention. And now-a-days the only thing that matters is what car you have? Where are we headed? What next?. 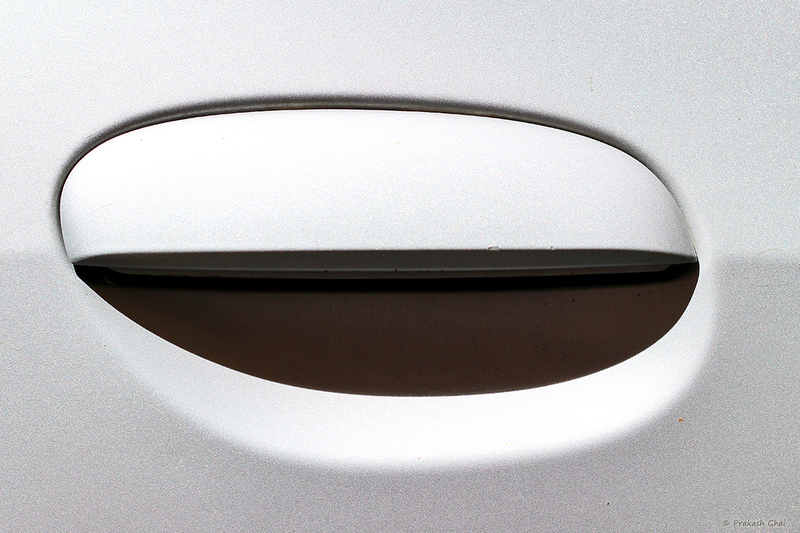 To Keep it Simple I have used a very common subject i.e the handle of a cars door. I was on my knees sitting on the small staircase of my veranda to bring the shot to proper eye level (very important). The suns rays were coming from behind illuminating the subject pretty well. I wanted to show the beautiful curvy design of the handle and the shadow being cast by it. No matter how hard you try but you will eventually get influenced by materialism and the greed that exists in the society. Just like the white cup (white signifying a simple non-materialistic lifestyle) soon you will find yourself to be all alone and overpowered by greed i.e. 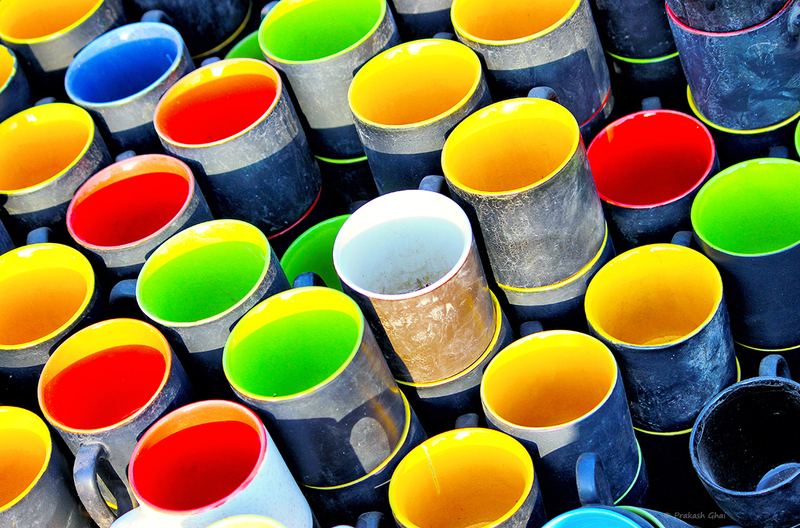 the colored cups. Maybe you don't want to run the materialistic race yourself, but you will have to do it for your family or loved ones or just to be at par or relevant in society. You cannot escape it. You just cant be a Buddha who said that you are born complete and all that you need to do is to shed what you already have. In today's world, no one values that sort of a mindset. Life is a numbers game and its all about money, money and more money without any caps. Success is money and no you can not change it. Of course for artists, photographers included and a few others, success means something else or much more than money but you have to show numbers (money) to your peers or else they just wont let you live. OK, now lets get back to the shot. 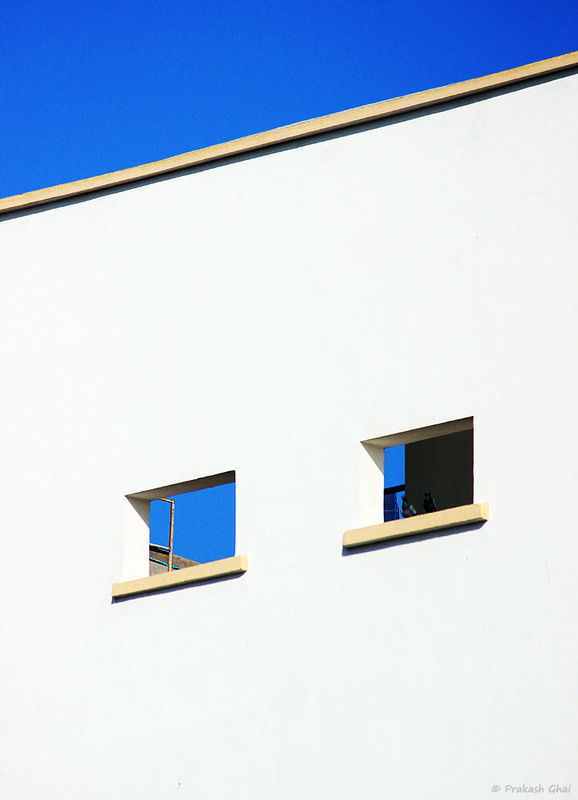 The photo falls under the Minimalism Category: Minimalism as in Repeating Shapes. The photo is "Maximally Minimal." I stumbled upon these cups while at a craft exhibition. The sole white cup amongst the many colored ones caught my eye. And of course these are circles in repetition and not an abstract photograph as there is a clear reference to the real world and the form is evident i.e circles.